Asbestos bulk fiber identification is performed using a polarizing microscope. The most common method used for bulk fiber identification is by following NIOSH 9002 standards. Polarized light microscopy measures the percentage of asbestos as perceived by the analyst in comparison to the standard projections, photographs or experience. The quality of the results are dependent upon the skill and judgement of the operator. Asbestos bulk fiber identification microscopes that meet NIOSH 9002 standards include a polarized light microscope 100x - 400x with a 10x dispersion staining objective. 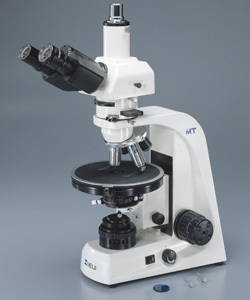 A stereo microscope with 10x - 45x is also often used. Dispersion staining is a process where color is imparted to colorless objects with a refractive index measured and used to identify the object being tested. Microscope World's asbestos bulk fiber identification microscopes use 10x annulus dispersion staining objective for the infinity corrected microscope. Different colors are observed when the fiber is oriented parallel or perpendicular to the polarizer direction. You can learn more about the US Center for Disease Control's NIOSH 9002 methods here.